The plaque commemorates 125 years of public health services in Mortlake and recognises the efforts of staff and the community. A tree was planted by Nika Cox, the granddaughter of Mrs E.J. Claridge, who was recognised for her work on the committee which raised funds to convert the Mortlake Fever Ward into a district hospital and was at the inaugural meeting held to form the Mortlake District Hospital Auxiliary. 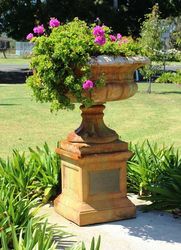 In 1932, she was made a Life Governor of the Mortlake District Hospital and was considered a tireless fundraiser until she died in 1957 and was buried in the Mortlake cemetery. 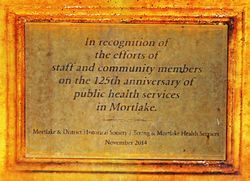 In recognition of the efforts of staff and community members on the 125th anniversary of public health services in Mortlake.